The feeling of being inside one’s own body is not as self-evident as one might think. In a new study from Sweden’s Karolinska Institutet, neuroscientists created an out-of-body illusion in participants placed inside a brain scanner. They then used the illusion to perceptually ‘teleport’ the participants to different locations in a room and show that the perceived location of the bodily self can be decoded from activity patterns in specific brain regions. The opensource study is published in the journal Current Biology. The team state that the sense of owning one’s body and being located somewhere in space is so fundamental that humans usually take it for granted. To the brain, however, this is an enormously complex task that requires continuous integration of information from our different senses in order to maintain an accurate sense of where the body is located with respect to the external world. Previous studies in rats have shown that specific regions of the brain contain GPS-like ‘place cells’ that signal the rat’s position in the room, a discovery that was awarded the 2014 Nobel Prize in Physiology or Medicine. To date, however, it remains unknown how the human brain shapes perceptual experience of being a body somewhere in space, and whether the regions that have been identified in rats are involved in this process. In the current study the scientists created an out-of-body illusion in fifteen healthy participants placed inside a brain scanner. In the experiment, the participants wore head-mounted displays and viewed themselves and the brain scanner from another part of the room. From the new visual perspective, the participant observes the body of a stranger in the foreground while their physical body is visible in the background, protruding from the bore of the brain scanner. To elicit the illusion, the scientist touches the participant’s body with an object in synchrony with identical touches being delivered to the stranger’s body, in full view of the participant. The team state that in a matter of seconds, the brain merges the sensation of touch and visual input from the new perspective, resulting in the illusion of owning the stranger’s body and being located in that body’s position in the room, outside the participant’s physical body. In the most important part of the study, the scientists used the out-of-body illusion to perceptually ‘teleport’ the participants between different places in the scanner room. They then employed pattern recognition techniques to analyze the brain activity and show that the perceived self-location can be decoded from activity patterns in specific areas in the temporal and parietal lobes. Furthermore, the scientists could demonstrate a systematic relationship between the information content in these patterns and the participants’ perceived vividness of the illusion of being located in a specific out-of-body position. The sense of being a body located somewhere in space is essential for our interactions with the outside world and constitutes a fundamental aspect of human self-consciousness, state the researchers. The team go on to add that the results are important because they represent the first characterization of the brain areas that are involved in shaping the perceptual experience of the bodily self in space. The data findings showed that one of the brain regions from which the participants’ perceived self-location could be decoded was the hippocampus, the structure in which the Nobel Prize awarded ‘place cells’ have been identified. This finding is particularly interesting because it indicates that place cells are not only involved in navigation and memory encoding, but are also important for generating the conscious experience of one’s body in space conclude the team. 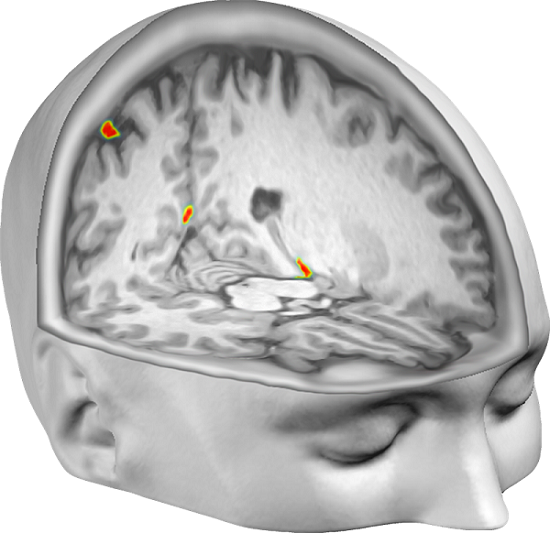 Brain regions in which the scientists could successfully decode the participants’ perceived self-location from patterns of neural activity. Credit: Malin Björnsdotter/Arvid Guterstam. Henrik Ehrsson , Arvid Guterstam , Malin Björnsdotter.